As a collective, South African consumers are in serious debt. According to statistics, more than half of consumers owe about 75% of their income to creditors. FNB's Head of Consumer Education Program Eunice Sibiya says it's extremely important for consumers to pay attention to their appetite for debt and spending habits so they can be on their way to financial freedom. 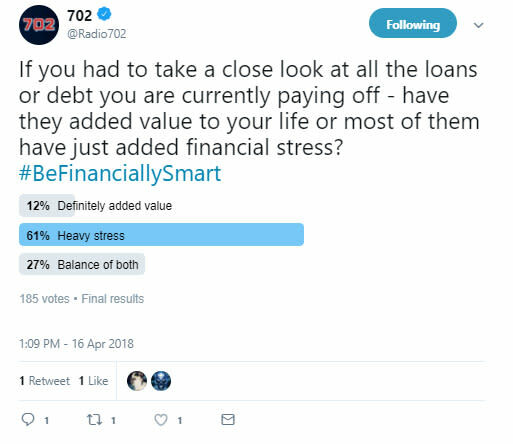 Before you take out a loan, you need to be honest with yourself and ask whether it's for a need or want, will it add value to your life or will it add financial stress"
If you fail to pay back the money you borrow, you could find yourself in deeper financial trouble than before you took the loan. Always ask yourself whether the loan will add value or financial stress to your life. Some loans such as business or study loans are there to help you better your life. Home loans are also good however it is important to take a home loan that you can actually afford. According to Eunice Sibiya it's a good idea to save up at least a 10% deposit to reduce the term of the loan and the monthly repayments. The faster you pay off your home loan, the quicker you'll own your property. Eubice Sibiya says the most important thing you need to remember when it comes to your finances is to live within your means. save and invest as much as possible and spend much less than you earn. Cut down on reckless borrowing and expenses, and aim to pay off your debt quicker and increase your savings and investments.